The tomb of Saadi, the poet and mystic of 7th century Iranian, 13th century western (about 1207-1291). Marble tomb dates from 1860s, an octagonal shaped building, walls inscribed with Saadi work in tile. An underground pool where people throw coins into the water and make a wish. You can purchase food and drink near the entrance. 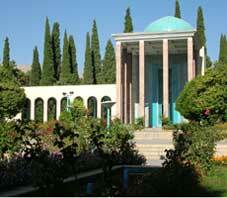 Gulistan (Rose Garden), his most famous work, translated in many languages.